Implementing large-scale government-sponsored civilian identification programs is a highly complex project. Selecting the right technology partner and a solution with the flexibility to scale based on future growth requirements are of key importance. We provide System that dedicated top-rated multi-modal algorithms to ensure one identity per person, regardless of the biometric required � fingerprint, face or iris. With increasingly urgent need for reliable security, biometrics is being spotlighted as the authentication method for the next generation. Among numerous biometric technologies, fingerprint authentication has been in use for the longest time and bears more advantages than other biometric technologies do. Fingerprint authentication is possibly the most sophisticated method of all biometric technologies and has been thoroughly verified through various applications. Fingerprint authentication has particularly proved its high efficiency and further enhanced the technology in criminal investigation for more than a century. Even features such as a person�s gait, face, or signature may change with passage of time and may be fabricated or imitated. However, a fingerprint is completely unique to an individual and stayed unchanged for lifetime. This exclusivity demonstrates that fingerprint authentication is far more accurate and efficient than any other methods of authentication. Also, a fingerprint may be taken and digitalized by relatively compact and cheap devices and takes only a small capacity to store a large database of information. With these strengths, fingerprint authentication has long been a major part of the security market and continues to be more competitive than others in today�s world. The beginning of fingerprints goes back to as early as the ancient times. According to historical findings, fingerprints were used on clay tablets for business transactions in ancient Babylon. In China, thumb prints were found on clay seals. But it was in the 19th century that the results of scientific studies were published and fingerprint technology began to be considered more seriously. Using the1800�s scientific studies as a foundation, fingerprint technology was already in use by the beginning of the 20th century. In 1924, FBI(Federal Bureau of Investigation) is already known to have maintained more than 250 million civil files of fingerprints for the purpose of criminal investigation and the identification of unknown casualties. In the late 1960's, fingerprint technology met a great turning point when it gave birth to 'live-scan,' a method to obtain a fingertip image without the use of print ink. When the FBI announced that it planned to stop using paper fingerprint cards inside their new Integrated AFIS (IAFIS) site, it was actually announcing the remarkable breakthrough of today's live-scan technology. But fingerprint identification technology did not stop as a forensic method only. It was officially used for business purposes in 1968 at one security corporation in Wall Street. Fingerprints are now being used as a secure and effective authentication method in numerous fields, including financial, medical, e-commerce and entrance control applications. Modern applications of fingerprint technology rely in large part on the development of exceptionally compact fingerprint sensors. As the advanced technology enables even more compact fingerprint sensor size, the range of application is extended to the mobile market. Considering the growing phase of the present mobile market, its potential is the greatest of all application markets. 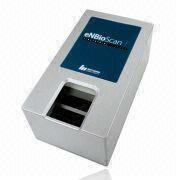 International Biometric Group,「Biometric Market Report 2000-2005」, 2001. Anil K. Jain, Lin Hong, Sharath Pankanti, Ruud Bolle,「An Identity Authentication System Using Fingerprints」, 1997. As shown in the diagram above, fingerprint identification system compares the input fingerprint image and previously registered data to determine the genuineness of a fingerprint. All the steps described above affect the efficiency of the entire system, but the computational load of the following steps can be reduced to a great extent by acquiring a good-quality fingerprint image in the first step. Real-time image acquisition method is roughly classified into optical and non-optical. Optical method relies on the total reflection phenomenon on the surface of glass or reinforced plastic where the fingertip is in contact. The sensor normally consists of an optical lens and a CCD module or CMOS image sensor. In contrast, semiconductor sensors, as a typical example of non-optical sensors, exploit electrical characteristics of a fingertip such as capacitance. 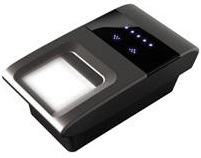 Ultrasonic wave, heat, and pressure are also utilized to obtain images with the non-optical fingerprint sensors. Non-optical sensors are said to be relatively more suitable for massive production and size reduction such as in the integration with mobile devices. Detailed comparison is found in Table 1. There are two main ways to compare an input fingerprint image and registered fingerprint data. One is to compare an image with another image directly. 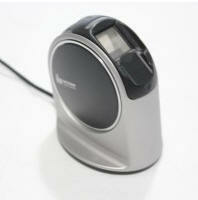 The other is to compare the so-called 'features' extracted from each fingerprint image. The latter is called feature-based/minutia-based matching. Every finger has a unique pattern formed by a flow of embossed lines called �ridges� and hollow regions between them called �valleys.� As seen in the Picture 2 below, ridges are represented as dark lines, while valleys are bright. The matching step is classified into 1:1 and 1:N matching according to its purpose and/or the number of reference templates. 1:1 matching is also called personal identification or verification. It is a procedure in which a user claims his/her identity by means of an ID and proves it with a fingerprint. The comparison occurs only once between the input fingerprint image and the selected one from the database following the claim by the user. On the contrary, 1:N matching denotes a procedure where the system determines the user's identity by comparing the input fingerprint with the information in the database without asking for the user's claim. 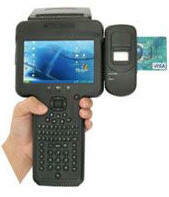 A good example of this is AFIS(Automated Fingerprint Identification System) frequently used in criminal investigation. The output result of the matching step is whether or not the input fingerprint is identical to the one being compared in the database. Then how could the accuracy of the matching procedure be represented in number? The simplest measures are FRR(False Reject Rate) and FAR(False Accept Rate). The former is the rate of genuine user's rejection and the latter is the rate of impostor's acceptance.